“Your garden will love a “cuppa” worm tea on a regular basis! 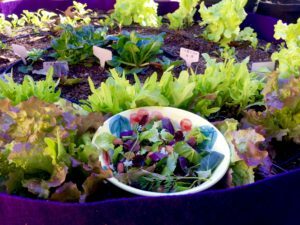 Welcome back to the “Feeding Your Garden” blog series. One of the keys to a healthy, productive garden is to feed your plants and garden soil powerful, organic nutrients on a regular basis. In the last post, we learned what a powerful soil amendment worm castings are, in this post, we’ll learn all about worm tea. Worm WHAT? Yes, worm tea. No, you don’t drink it, but your plants do, and they LOVE it! Although I had a worm bin at one time, I found it time consuming and difficult to produce the amount of worm castings I needed for my garden, let along produce worm tea. VermisTerra does all the heavy lifting with their ready made earthworm tea. Their worm tea is microbial-rich concentrate, shelf-stable, comes in a quart or a gallon size, and is a snap to use on my garden. Along with VermisTerra’s worm castings, I have been using their worm tea in my garden for several month – the results are impressive! I like to call it “liquid gold”. My lettuce gardening is thriving with a weekly dose of worm tea. 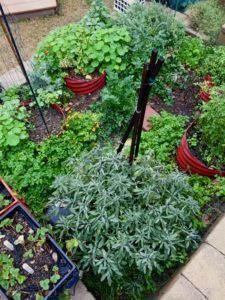 Lettuce garden – My lettuce garden receives a weekly dose of VermisTerra worm tea, and produced loads of lettuce through a fall heat wave, and is still going strong today, well into the winter. We eat out of it every single day! And because the worm tea makes the plant tissues stronger, the greens last me 7-10 days in the fridge after harvesting! Strawberry Crate Towers – Many of you have seen my strawberry crate towers in my videos. To test the effectiveness of VermisTerra worm tea, for several months, I watered one tower with VermisTerra worm tea once a week, and the other towers with the same liquid fertilizer I have always used once a week. 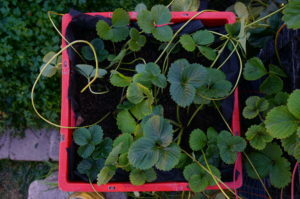 The strawberry plants watered with worm tea held up to frosts with minimal damage to the leaves, have larger leaves, and are starting to flower. The plants that did not receive their “cuppa” VermisTerra worm tea had significant more leaf damage after a frost, leaves are smaller, and have no flowers. Worm tea at work! VermisTerra worm tea provides a nutrient boost to your plants! Worm tea is an organic liquid fertilizer derived from worm castings, and is a powerful soil nutrient that contains all the benefits of worm castings. It gives your plants a boost and works quickly to provide your garden powerful nutrients. VermisTerra worm tea contains microbes and beneficial bacterial that are dormant in the concentrate, but are activated upon adding it to water. These microbes and beneficial bacterial go to work immediately upon being applied to your soil to help your plant be healthy and produce lots of fruits and veggies for you to share with your loved ones. Why is Worm Tea Beneficial for Our Gardens? 1. Rich in Beneficial Bacteria and Microbes – Like VermisTerra worm castings, their worm tea contains powerful beneficial bacteria and microbes – microscopic organisms that help create a healthy, living soil. 2. Improves Soil structure – Microbes in the worm tea have the ability to create pore spaces in the soil. 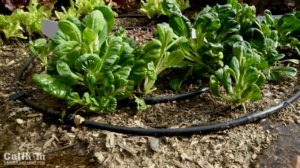 Not only will this help your soil retain water for longer periods of time, but also means more oxygen and water can penetrate the soil and be taken up by your plants. When your plants are consistently watered with worm tea, they will be able to root easier, and take up the nutrients they need to be healthier and productive. 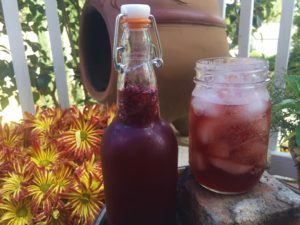 Probiotic-rich kombucha tea feeds good bacteria to our bodies, worm tea feeds good bacteria to our soil. 3. 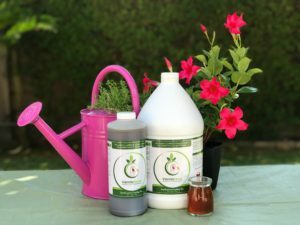 Supress Pests and Diseases – As soon as you apply the microbe-rich worm tea to your plants, the army of microbes that are so helpful to plant growth get right to work and start to multiply. These “good guys” live around the roots and surfaces of your plants, keeping them healthy. Your garden will be equipped to fight off disease, and pests aren’t as attracted to them. Many farmers who have tested VermisTerra worm tea report reversal of disease and increase in fruit production in their crops! I like to compare this to feeding my body food rich in probiotics and beneficial bacteria – such as kefir, and my favorite, kombucha. These foods feed my body good bacteria, helping everything to function as it should. This gives me the ability to fight off a cold or flu much easier than if my immune system was compromised. What Makes VermisTerra Worm Tea Special? VermisTerra Worm Tea – “Liquid Gold”. 1. Extended shelf life – VermisTerra worm tea, in it’s concentrated bottled form, is shelf stable for more than a year. Contrast this to compost tea that loses it’s effectiveness if it does not get enough oxygen, and can then possibly contain harmful bacteria such as e-coli and salmonella. 2. Certified organic and lab tested – VermisTerra is certified organic by the USDA, and the California CDFA. Each batch of worm tea is lab tested (something very unusual in the industry) and free of pathogens. In fact, UC Berkley tests found over 2000 types of good bacteria in a sample of tea. VermisTerra takes great care to make sure that their worm tea is of the highest quality! VermisTerra worm tea is especially effective when used alongside their worm castings and can also be used in along with organic fertilizer and compost. It’s easy to incorporate watering with worm tea into your regular garden routine. The key is: a little goes a very long way and use it regularly. Just like our bodies need a regular supply of good nutrition to be healthy, so does our garden! The general rule of thumb is to use 3-6 ounces of worm tea for every gallon of water, and use the same day you make it. Take care not to splash water into the bottle, as the microbes are dormant in the bottle (helping it to be shelf stable), and water will activate them. 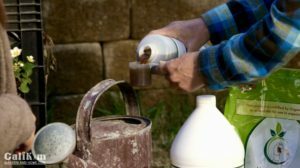 Add worm tea to your watering can or directly to your drip irrigation system, or even to a hose end sprayer as a foliar spray. Just like worm castings, it won’t burn your plants, and you can’t use to much. Use a little, use a lot, use what your plants need and what you can afford. 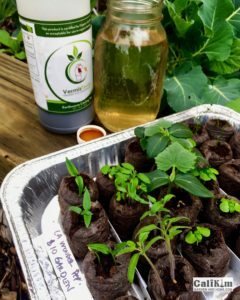 VermisTerra worm tea is the perfect liquid fertilizer to use on your young seedlings. It is gentle and won’t burn them. The young plants will take up just the nutrients they need to help them to thrive until it’s time to transplant them in your garden. How-to: Mix one capful into a quart of water,pply once a week, more often more often if desired. Container plants need consistent moisture and nutrients to thrive. Worm tea provides them the nutrients they need and help the soil retain moisture. How-to: 3-6 ounces of worm tea per gallon of water. Apply once a week, more often if desired. Using worm tea in your garden beds will increase the survival rate of your transplants, and makes your soil healthier. How-to: 3-6 ounces of water per gallon in your watering can, or apply to directly through your drip irrigation system. Apply every two weeks, more often if desired. Watch the video from my YouTube channel below “How to Use Worm Tea in Your Garden”, to see a demonstration how to use it, and to enter a drawing for free VermisTerra worm tea and worm castings. Watch today – entry deadline is February 25th, 2017! To purchase VermisTerra worm tea or castings, click on the “Partner’s Store” tab at the top of this page, use promo code “calikim” for 10% off. Receive free shipping for any orders over $55. For a limited time, they are offering a free quart of worm tea (a $26.99 value) with any purchase, so you can try it out for yourself! Have you ever used worm tea in your garden? Comment below and let me know! Thanks to VermisTerra for providing the worm tea I used to test in my garden, and for sponsoring this blog post. Some of the links in this post are affiliate links – I make a small commission when you order through these links and its helps me keep the garden content coming! Got my Vermisterra order of castings and tea! My only complaint is that the shipping was pretty high. I did get the free quart, so that wiped out the shipping cost. Was there another option that I didn’t see, or are we stuck with it? Also, I do hope you do some hydroponic videos someday. I’m just trying to create my own tiny aerogarden type situation with a few plants, and boy oh boy, could YouTube stand to have the CaliKim treatment on the subject! Holy cow. Trying to get info on how to simply feed one plant in a quart mason jar was really difficult. The easiest (and most easy going) guy out there that I could find was Khang Starr and his videos. But even with him, so many questions, and sooooo many products. It’s really confusing…. Anyway, hope you consider that at some point. I’m sure you could shed some light on the subject like you do with all things gardening. It also might be a good wintertime project. Again, thanks for all you do. I can’t wait to get started with my seeds here in the Chicago area. Apologies for the delayed response! So glad you are using the Vemisterra worm tea and castings! They do now have free shipping for orders over $55 and are also offering a standard variety of castings that costs less and is still just as powerful. The only difference is that it is not quite as fine as the original castings and has bits and pieces of wood chips. I got my first bag today and it looks wonderful. I hope that helps you save a few bucks on your next order! Thanks for your suggestion on hydroponics. How exciting to be trying something new – always fun! I don’t have any plans to delve into hydroponics at this time, but you never know what could change. Thanks so much for your kind words! Have you been able to get any seeds started yet there in Chicago? Great to hear about the free shipping and other deals from Vermisterra. I will definitely continue ordering from them if that’s the case. I have to really contain myself in March because I so want to start my seeds! However, in zone 5 our last frost is around May 21st. I have written notes to myself not to start anything before April 1st because I have in the past and my seedings were huge by the time they went in to their boxes and pots. That seems to work best in my area. I do self sow a lot of cold weather greens in lettuces before our last frost date. Still, it’s so hard! I did buy a few Smart Pots to try out this summer. I found some at a nearby hydroponics store, as well as at Amazon. They said they only use Smart Pots for their fabric pots because they have found them to be the best after having sold and used other brands in the past. So, another thumbs up for the Smart Pots. Thanks again for the Vermisterra follow up. I hope the month goes quickly so you are able to get your seeds started – bet you are itching to get at it! Are you getting going with greens now? Glad you like Smart Pots too! In my opinion, they are simply the best fabric container out there. I will definitely pass your feedback on to them. Happy Gardening and think spring! Just order some for my garden. Plants could use the benefit of boost against pest. So glad you ordered some, Janet! Let us know what your results are! What are you growing or preparing to grow in your garden right now? Thanks for stopping by! I like that VermisTerra doesn’t have to be aerated before using. Some can’t be used for 24 hours, but not this. Think I’d like this better. Also like that it comes from worm castings. Yes, it’s pretty amazing how powerful the microbes and beneficial bacteria are in this tea and how they protect our plants, and help them be productive. I hope you get to try some for yourself! Thanks so much for visiting the blog! Did you quit using the fish fertilizer? I used diluted worm tea on my vegitable plants and got wonderful results. I am having trouble with so many ants invading my worm farm bin trays. I tried to apply some tips such as a gentle water spray, fresh crushed mint leaves and putting legs of worm bin into jars filled with water etc. but still couldn’t stop ants invading into worm farm trays. Would like to get more suggestions and tips to stop ants entering into worm farm bin trays.